The need of having a Passage Retrieval (PR) system for Arabic texts is due essentially to our aim to build an Arabic Question Answering (QA) system in our research team. We have chosen working on the PR system to be our first step to pursue our aim because being the core component and its quality will affect directly the performance of the QA system. JAVA Information Retrieval System (JIRS) is a PR QA-oriented system, multi-platform, open source and free to use. JIRS uses an n-gram model and it is language-independent. It separates language configuration files to make easier its adaptation to any language. In this paper, we report the different challenges when adapting the JIRS to the Arabic language.In order to evaluate JIRS on Arabic, we had to develop an Arabic test-bed using the multilingual CLEF QA one as guideline. We also report the results obtained in our experiments where we retrieved Arabic passages with JIRS first without any text preprocessing and second performing a prior light-stemming on the documents of the test-bed. 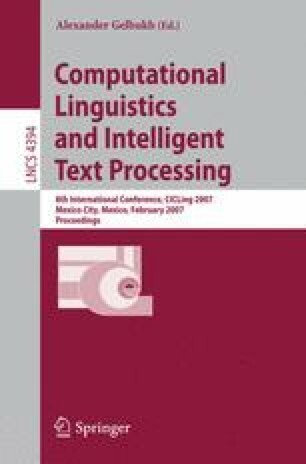 The preliminary results show that it is possible to obtain a first Arabic passage retrieval system adapting JIRS on pre-processed text with a light-stemmer.